Just What Is A Reef Tank? Basically, a reef tank is a mini ecosystem that is enclosed, and looks just like a micro tropical reef. Each of the life forms inside correspond to one another just as they would in the wild. It gets technical but each creature, whether fish on down to microorganisms, complete a series of cycles that accommodate each other. Fish, shrimp, bacteria found in the food and rocks, the lighting system, oxygenation systems, the reef that aids for filtration and shelter, all correspond in an equilibrium like one would find in a real reef. How Big A Tank Should I Purchase? To answer this requires realizing that the bigger the container, the less impact errors will have on the ecosystem itself. Only one mistake could upset the entire apple cart with a small tank, so it’s good to consider a larger one just to be on the safe side. You need room for the life forms, support materials like reef and coral, equipment for oxygenation, and of course for display. The creatures need that room to move about and not get bored and not bump into one another. The method most recommended in regard to this is the “Berlin Method”. This process entails a protein skimming, lots of strong lighting and rock. However, freshwater filtration and biological filtration like trickle filters and canister filters. In addition, HOB or Hang On Back filters should not be used in the marine aquarium. The reason being is because they can clog up with materials and send dangerous nitrates back into the ecosystem which can harm the life forms in the environment. Maintaining this type of aquarium calls for adapting to size and volume. Primarily, changing the water is the biggest issue. Ignoring this can lead to disaster. You should test your water often, and this cannot be understated. If you’ve got a large amount of creatures in your aquarium, you’ll have to change the water more often than the recommended 4 weeks. Two weeks is the best bet here. At least 20% of the water every 2 weeks should do it. In addition there is checking all equipment, making sure nothing is dirty, clogged, tangled up. Keep the outside glass clean without debris on it, and check for any vermin that might have been curious enough to get caught in something, like ants and such. Testing the water parameters of your tank regularly will be the difference between success or failure of your reef aquarium. Below is a list of recommended test kits for the specific functions, as well as to the time schedule you’ll need to follow. It’s adaptable, so it’s not written in stone, but a good foundation guideline to follow. These test kits are the standard and should be used. Check the expiration dates of each of these. Of additional note, some or actually the majority of phosphate kits aren’t efficient enough to detect the levels you need for a precise reading. 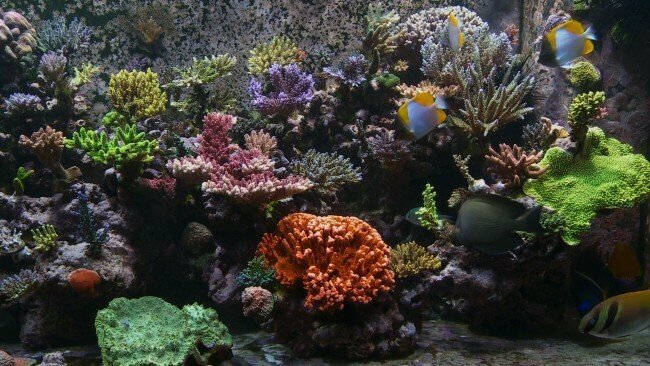 How Much Does A Reef Aquarium Cost? Depending on the size of the aquarium, the equipment needed, the type of fish, and other life forms, the cost of a reef aquarium varies to a good degree. The average run of the mill size tank is not going to be cheap. You will find that some aquariums can range for a few hundred dollars, to thousands, to upwards of a hundred thousand dollars and more. Some people just go all out for these aquariums, and some fish are very expensive. Same with some coral and other creatures. The materials the aquarium and equipment are made out of counts too. Take a look at our 55 Gallon and 75 Gallon Aquarium guides to find a reef aquarium that suits both your budget and aquatic needs. Take into account, that you’ll be spending money up front. Things like the cost of the tank, heating, lighting, power heads, cooling, reactors, and more. You’ll be using artificial saltwater, or even natural seawater. The continued maintenance costs involve test kits, replacement bulbs, additives, energy bills. To cut costs, educating yourself is paramount. There’s a plethora of information on the web alone. Message board forums, Facebook pages, and even clubs that may be found locally. You’ve got to really dig in deep here. You’re going to be managing an entire min I ecosystem and the creatures inside. Their lives depend on your continued attention and care. Just like a real ecosystem, should one thing go wrong, you could collapse the entire thing. This is why reading and asking questions is not only essential, but mandatory. Networking with other aficionados may gain you discounts on equipment as well. Talk to the manufacturers to look for any breaks and discounts and freebies as you can get your hands on. Check reviews of materials and services. Don’t leave one stone unturned and you’ll save money from the start and in the long term. Just What Does Cycling Mean? One of the most important duties with a reef aquarium, outside of putting water into it, is cycling. Cycling is the bio filtration process that lets your tank mature to a level to allow for enough bacteria volume to bring about the breakdown of toxic ammonia into nitrite and then into nitrate. You can not have a reading for ammonia higher than 0. It will take somewhere between 2-4 weeks to achieve this but you should have a 0 reading for nitrite alone, usually taking 4-6 weeks, before even putting any creatures into the tank. It will take about 90 days for the cycling process to be complete. The only way to hasten the process is with very high quality live rock. Make sure to read every detail about cycling. It is the fundamental process whereby your aquarium will be built upon. Make a mistake at this step and you’ll be in for a world of hurt. What Is Meant By Live Rock? When you hear the term “live rock” in regard to an aquarium, it basically means corals that are inhabited by bacteria that are beneficial to the ecosystem of the aquarium. These corals are Aragonite, the left over coral skeletons. It’s a porus rock where the anaerobic bacteria and other creatures inhabit. The live rock serves as a source of free nitrogen gas, created by the anaerobic activity of the bacteria within. This process performs a natural bio filtration. What Is Meant By Base Rock? When someone refers to “base rock”, it’s actually the same as “live rock”, made from Aragonite, but doesn’t have the bio organisms dwelling in it. If necessary, the base rock can be converted to live rock. What Does A Calcium Reactor Do? A calcium reactor is a chamber that contains calcium carbonate media. Using a bubble counter, the chamber is injected with CO2 gas, which serves to increase or decrease acidity, thus making the media to breakdown. Using a continuous calcium supplement to your coral, the carbonate is drip fed into the tank. Find out more about CO2 in your reef tank on our detailed FAQ here. To remove excess waste from the aquarium, a skimmer is used. Foam Fractionation is the term used for Protein Skimming, the two are interchangeable terms, using a device that creates very fine bubbles that express as foam and the organic impurities get attached to it. Then the foam is removed from the device to a collection cup that is later thrown away. This device is of utmost importance and thorough study in how it operates is recommended. Further detail on protein skimmers is available at the reef keeping website here. Just as it sounds, a chiller is a device to cool down the water of the aquarium. If yo live in an area where the room is cool enough, you r lighting may be sufficient in keeping things at the right temperature, however, if not, you need to keep the temperature low enough to keep things from heating up in your tank. Some lighting can be too much and heat things up. The best target for temperature should be about 77 degrees Fahrenheit, or 25 Celsius. You should be concerned if your tank’s temperatures rise above 81 degrees or 27.5 celsius at that level of temperature, you will definitely need a chiller. What Is Kalwasser / Limewater? From the German language, the word, kalwasser is basically the word, limewater. This is saturated calcium hydroxide. It has a high pH between 12-12.5. Using top off water, it is dissolved in a slow drip feed. This helps to maintain pH and alkalinity as well as add important inorganic calcium to the tank. You’ll need to add 1 teaspoon of the kalwasser powder to about 1.3 gallons or 5 liters, of water, mix it up good and add slowly, 1-2 drips per second, is best done. Use your own discretion here depending on water volume etc..
To purify the water, activated carbon is used. It will eliminate that yellowy tinge or film, that is seen in an aquarium. The water clarity is important to your aquarium in several ways, allowing light to do its job for plants and allows you to see what’s going on, as well as prevent disease. Basically the simple route is using a filter sock and putting it in an are where the flow is slow to moderate. The carbon media is porous and thus attracts and eliminates metabolic waste. Just use 1 cup for every 50 gallons or 190 liters of water. Of note, use the best activated charcoal. It will server you better in the short and long term. To separate solids from water, the process of reverse osmosis or RO is done. It is a purification procedure that has the water under pressure and forces its way through the RO membrane. On one side of the membrane, there is a s solute where pure water passes out the opposite side. Done correctly it will reduce impurities in the water by 95%. It is also used in accordance with DI, aka, Dionization, to create the water of the highest purity. The process of water purification known as deionization, where water is slowly passed over some ion exchange resin, often, small beads, that attract ions such as copper, iron, chloride from water. Combined with RO, the process creates highly purified water that is used to replace water from evaporation. It doesn’t create any nutrients to the ecosystem and won’t create algae growth. It can achieve 99% of water purity. The microscopic gloating plants like algae and diatoms are classified as phytoplankton. Phytoplankton is subject to motion and are not mobile in themselves. You can’t see them other than by microscope. They are eaten by zooplankton like amphipods and copeods. The tiny creatures that swim about in the water column are known as zooplankton. They’re tiny invertebrates and are mostly categorized as cladocerans, rotifers, copegods. They’re at the bottom of the food chain and eat phytoplankton. They in turn are fed upon by fish and larger creatures. Also known as “buffering capacity”, alkalinity is the measurement of the amount of water used to neutralize acids without compromising the pH. Due primarily to natural amounts of carbonate, bicarbone, and hydroxiide ions found in the water. The measuring of alkalinity is in kH, mEq/L, ppm. The proper measurement should be between 7-11kH (2.5-4.Omeq/1 or 125-200ppm CaC03). It is generally maintained by using baking soda in 1 tspn per 45 gallons by approximately 1kH), the use of a Calcium Reactor or a drip feeding Kalkwasser. The importance of calcium cannot be understated here. It is an essential element of a reef tank. The corals themselves use calcium to build their skeletal structures from the calcium carbonate that is extracted from the water. Calcium measurements come in ppm and are maintained between 380-450 ppm calcium ion (950-1125 ppm CaC0 equivalents). The levels of the calcium should be maintains by using a Calcium Reactor and dosing is in the amount of calcium chloride dehydrate (CaC12), kalkwasser, (limewater) or other alternatives. If you’re mixing CaC12, its solubility in the water at 20 degrees Celsius is approximately 75g per 100 ml. The third most essential element that is dissolved in seawater is magnesium. It is in an abundance about five times more than calcium. It’s important for the biological processes of every known living organism. It is measured in ppm and must be maintained between 1250-1350 ppm. The levels of magnesium should be maintained by dosing magnesium chips to a Calcium Reactor or by the mandatory amount of magnesium chloride hexahydrate (MgC12) aka “magflake”. There are other alternative names. If you mix MgC12, its solubility in seawater at 20 degrees Celsius is approximately 170g per 100 ml of seawater. NO3 aka nitrate, is an oxidized ion of the gas nitrogen, and in regard to bacteria that convert nitrate aka NO2, to nitrate, this is known as the nitrogen cycle. To fight off detrimental buildups of algae from accumulating nitrate, it is mandatory that you maintain as low a nitrate level as possible. The nitrate is found in measurements of ppm and the right level is between 0-5 ppm in a reef tank. If you have just fish in an aquarium, you can allow for higher levels. PO4 aka phosphate is a compound of phosphorus which is a trace element that occurs naturally in seawater but at very low increments. Usually about 0.002 ppm of phosphate is found in the seawater. Known as an algae fertilizer, it is essential for the growth of algae that is undesirable in a reef tank. There are several factors by which phosphate levels rise are unfiltered tap water, calcium additives, some salt mixes, activated carbon and kH buffers. To alleviate the problem, using Kalkwasser can aid in reducing phosphate levels. It is measured in ppm and is best to be kept at 0.03 and lower. When we talk about pH, we’re talking about a measurement regarding the acidity aka alkalinity of a solution. PH is measured on a level of 95 which is the most acidic upwards to 14, the most alkaline with the number 7 being neutral. That means the solution is neither alkaline nor acidic. In regards to a reef tank, pH should be maintained at a level of 7.7 to 8.5, or better yet, between 8.1 to 8.3. To stabilize the pH, make sureyour tank is located in a well-ventilated area, perhaps with some windows open, and the tank has enough water movement. Reverse lighting can be used if you have a refugium. The measure of the amount of salt in the water is known as salinity. 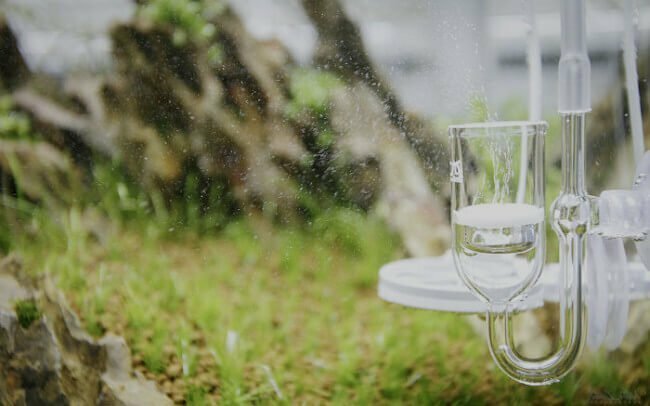 It is measured in ppt, seawater has 35 ppt, and is based on the idea of what is referred to as “dry weight” of the salt content in relationship of pure water. Using what is known as “specific gravity”, we’re able to measure the salinity as no other means other than boiling away the water and measuring what’s left will get the level and that’s not a good idea. It calculates by measuring the relative density of the saltwater to the equivalent volume of the pure water. Of extra note is that liquids do expand with changes in temperature so the specific gravity is then expressed at a specific measured temp. Specific gravity should then be maintained to about 1.025 at a temperature of 77 degrees Fahrenheit aka 25 degrees Celsius. It is of great importance that you use a refractometer to measure the specific gravity as hydrometers are not reliable. The water in my reef tank is evaporating, what to do? It’s natural for the water to evaporate. The trick to remedying the situation is of great importance. Do not top off the water with more saltwater or seawater. Instead, use fresh water so as not to alter the pH balance too much. Evaporation depends mostly on the lighting you use and room temperature as well as sunlight that hits the tank. The pH levels in my reef tank aquarium keeps dropping, what to do? Relying mostly on CO2 and alkalinity, the pH levels of your tank can be affected by several factors. Think of it as a balanced yet delicate biosphere. When one thing happens to one thing, it has a direct effect on all the other things. Mostly, the coral in your tank are still growing and building, the little busy bodies they are will use up the calcium thus reducing the alkalinity of the tank’s water. This can be handled with simple attention to aeration. Making sure that good ventilation in the room as well as having an overflow chamber whereby the water overflow enters a sump. It houses the filtration equipment of the tank and the water that pours into it, is then pumped back into the tank. This helps considerably with gas exchanges needed to keep the pH balance. Just keep the aquarium aerated well as well as the kH, and the pH won’t be compromised. Coral problems, how to handle them? Trying to diagnose why the coral in your reef tank aquarium is suffering to one degree or another, depends on several factors. Remember, you’re working with an isolated aquatic biosphere, where multiple systems are going on all the time and the imbalance of one can throw off thing for another or all. There are, however, fundamental things that you can check on to see what might be affecting the coral. The first thing to heck is the salinity. If it’s out of balance by being too high or too low, it will cause your coral to melt. Generally this is the most regular problem for the newbie. To handle this a refractometer is the tool of choice for testing the water. Keep the salinity at 1.025 (+/- 0.002 is the standard ). Alkalinity and calcium are the next on the checklist. Coral use these for building their structures. There is a small range where this is optimum and should be kept with calcium at 380-450, and alkalinity at 7-11. Next is the flow. In order to thrive, coral need a good flow of water movement. They use this movement of water to flush out metabolic waste and in respiration and photosynthesis. Since this important factor is often overlooked, it is the downfall of many a newbie aquarium owner. Look for a minimum of 10 times the turnover in your aquarium with 20 being much better. Coral placement is next. One might not believe it, but coral are some feisty creatures. They battle for dominance in the tank and will sting one another. Their aggressive behavior might include them sending out what are known as ‘sweepers’ that can reach 6 inches in length or even longer. With this battle format, it’s best to make sure your coral has enough room in the tank and enough room away from one another. Lighting is important. You have to have adequate lighting for the process of hermatypic Or specifically the zooxanthellae that is inside the coral so that photosynthesis is at optimum levels. Not all coral are the same, so check each of the coral you have to see what their lighting requirements are for safe and efficient maintenance. The variety of life forms in your tank need to be the kinds that are able to interact with one another and the coral. Some fish can damage coral. They also might cause problems to mollusks too. Make sure you do the due diligence so that you’ll be populating your reef tank with the right balance of life. There is coral disease Check out the Coral Disease FAQ later for further details. Finally, there are a number of other reasons that cause coral to become compromised in structure and vitality. If things are out of your hands, it’s a good idea to use online forums to ask around such on as Reef Keeping. There are plenty of experts and professionals around who will be happy to help. The algae is bad and out of control, what to do? As your reef tank reaches maturity it’s common for algae to go haywire and end up with unwanted algea, it usually happens during cycling. It will continue until the live rock is totally devoid of any detritus stored within it. The live rock will leach and cause nitrates and phosphates that are the fuel for bad algae. The solution here is to support the war against bad algae with the factors that produce good algae, for example Coralline, the pink calcareous algae and coral. They’ll beat down the bad algae for the nutrients that are in your tank. You’ll need good nutrient export, because coal and corraline don’t uptake nutrients so much. To fight this, use phosphate removers and change the water regularly. The best solution is using a top notch protein skimmer. Don’t overfeed, or overstock your tank, and do not use tap water to top off your tank after evaporation. Use the right lighting to best optimize coral growth and not promote bad algae growth. Don’t panic if you see green hair algae aka bryopsis, cyanobactira, and diatoms before the tank reaches maturity and equilibrium It does take time so patience is a virtue here. Just be professional and consistent with your maintenance. In addition, activated charcoal can help fight off hair algae. The coral growth in my reef aquarium is poor, why? The culprit here is low calcium levels, pH being compromised, and alkalinity. As mentioned earlier, there is a balance of these factors that must be maintained or one will compromise one or more other factors thus leading to problems like low coral growth. Do what you can to maintain the proper stable parameters. Try dosing the tank with small amounts on a more regular basis instead of large amounts. Phosphate is also a corporate in the cause of slow coral growth and can contribute to bad algae. What is the cause of the gold and brown colored stuff on my rocks and glass? Enter, the diatoms. When diatoms gain ground after the tank has finished cycling or when new animals or rock are added to the tank, diatoms might arise. They feed of nutrients so it’s best to do what’s possible to minimize nitrates, DOC’s, and phosphates. Silicate is a major reason for diatom growth and it comes from tap water. Use filtered water instead to top off your tank. What is the red slime like coating that is on my substrate and rocks? Cyanobacteria is the probable culprit here, aka Red Slime Algae. If the slime has bubbles in it, it’s a clear indication of cyano. Cyano feed off nitrates, phosphates, and DOCs. Try reducing these factors and make sure the tank has sufficient ventilation. CO2 is another source of food for the Red Slime. Proper lighting helps to fight this too. Bleaching, what does that mean in regard to coral? When coral turns white from the tips downward, it means excessive lighting is at the root of the problem. The coral is white but it’s still alive. Try dimming the lighting and let the coral repair itself. The definition for STN/RTN is Slow/Rapid Tissue Necrosis. The prefix defines just how quickly the process of necrosis occurs. STN/RTN occurs when coral starts to bleach from the base of the coral upwards. STN is generally caused by the intro of a new colony that suffers from stress. The coral that is stressed produces chemicals that produces extreme reactions in the other coral. It’s time to get rid of the bad coral colonies to a tank where you can quarantine them. Changing the water and carbon will assist in the removal of chemical messengers from the water. RTN is generally caused by a sudden and abundant change in the parameters of the water. It is advisable to double check before adding any additives. The field of reef tank aquariums is so specialized it has its own nomenclature, thus a series of acronyms that are part and parcel to everything. Below is a list of acronyms that should assist you in understanding the hobby and industry. I hope you find the information and advice MyAquarium has given you useful, if you are looking to buy a 75 Gallon or a 55 Gallon reef tank, please take a look through our guides. 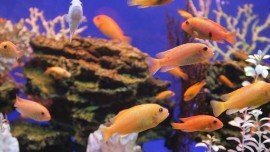 Failing that if you would like further advice on setting up an aquarium, choosing an acrylic or a glass aquarium or even just want more information on your fish tank’s manufacturer delve a little further in to the MyAquarium guides to find out more. 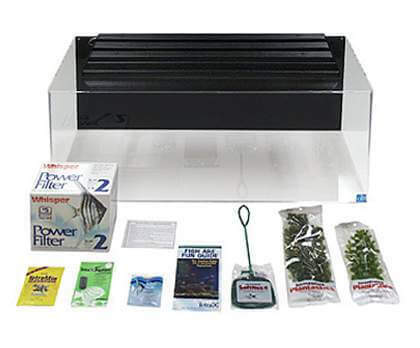 SeaClear offer a Junior Executive Aquarium kit providing everything needed to get set with a 40 gallon aquarium. Well reviewed and loved by tank owners this 40 gal tank hits the spot being made from acrylic rather than glass it is light weight, provides a clear and bright view than the standard material. Being manufactured by a supplier renowned for quality SeaClear deliver beautiful tank supplied with a complete setup include a power filter, tank hood, a selection of plastic plants, fish net, food and water condition backed by a limited lifetime guarantee. Available in three colors, clear, black and cobalt blue you can choose a tank that suites your décor. Whilst created as an entrée level kit this SeaClear 40 gallon regular rectangular tank can easily be amended in future to suit reef or marine applications through drilling to fit a stump although as it stands this tank is ideal for fresh and salt water applications. All you need to add to get going is gravel and some fish! This tank stands at 36” Long x 15” Wide x 16” High and being molded acrylic no support bars or black sealant to obscure aquatic views. As described in our Glass vs Acrylic post Acrylic has no tint thus improving viewing clarity, reduces weight and is stronger making ideal around children and other pets. Overall this SeaClear Junior Executive 40 Gallon Tank Kit offers great value for money for those looking to get started with a medium to large sized aquarium from a reputable manufacturer. The Aqueon LED 55 Gallon Aquarium kit was launched late 2013 to joining their premium range thus rivaling the similar and very popular Aqueon 55 Gallon 17770 Aquarium kit from the deluxe range. Like the rest of the Aqueon products in this range this is glass tank supplied with a black plastic slimline LED hood, 200w preset heater and QuietFlow power filtration system included. What's included? Glass Aquarium with Black Trim, QuietFlow™ Power Filter, Filter Cartridge, Slimline LED Hood, 200w Submersible Heater, Aquarium Set-up and Care Guide, Water Conditioner, Thermometer, Premium Fish Food, Fish Net. Price $$ - Just add water + fish. Availability Check stock availability and latest price online at Amazon. Standing at 48.25” Long x 12.75” Wide x 23.75” High this impressive glass tank ideal for saltwater and freshwater aquaria. On unwrapping the colorful packaging you will find all the essentials to get your large aquarium started including water conditioner, fish food, accessories and a comprehensive setup / start guide. The QuietFlow 55/75 power filter simply hangs on the back of the tank, supplied with two filters and is ideal for this 55 Gallon tank as it suites aquariums up to 90 Gallons thus over filtering and improving visibility. Using a 4 stage filtration system this filter has both more efficient and has a better flow than most others in the same category. Overall this is a quality glass tank from a reputable manufacturer, Aqueon, sold with a complete kit making it easy to get started with a large 55 gallon fish tank. 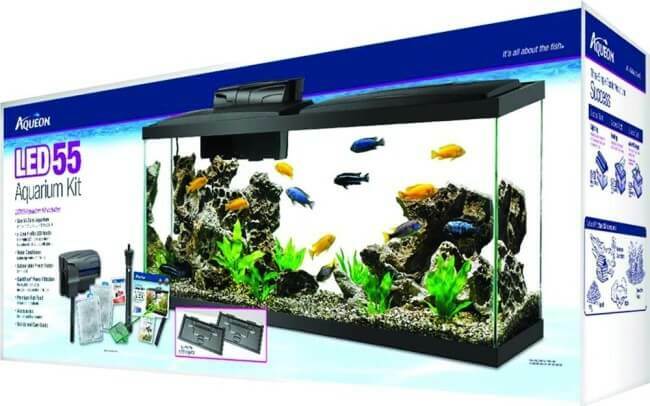 To find the latest price for this Aqueon LED 55 Gallon Aquarium or check stock availability, click here. CO2 in your Planted Tank – FAQ’s Solved! 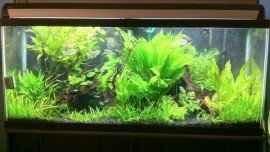 What purpose does CO2 (carbon dioxide) serve for a planted tank? Carbon dioxide is the raw material that plants use during photosynthesis to convert light into food, fiber, and other forms of biomass. Will CO2 harm my fish? CO2 will not harm the fish in your tank at normal levels (below 30ppm), but above this level is a different story altogether. What levels of CO2 should I have in my tank? A majority of people with planted tanks maintain a stable CO2 level of 20 ppm, though this may be hard to do the do-it-yourself method. You will find a more extensive explanation is question #6. Are there different grades of CO2? Yes. In the United States there are two basic grades of CO2. The first of these grades is the welding/food/beverage grade of 99.99% pure CO2, and the other is the Medical grade, which is 99.999% pure. The extra .9 costs significantly more, but you will find that there is very little difference, if any, between the two in terms of their efficacy. Is there any substitute for CO2? Seachem makes a product called Excel, which is a source of organic carbon. While this product doesn’t offer all of the same benefits that natural CO2 does, it is a good carbon source for your plants. Will DIY CO2 work on my tank? You will be able to make your own CO2 work in just about any tank. The only variable is how much work you are willing to put in to do this. It is extremely difficult to maintain stable CO2 levels if you are doing it yourself. A pressurized system is highly recommended for tanks that are over 25 gallons. What do I need for a pressurized system? The minimal requirements for a pressurized system include a cylinder, regulator, needle valve, check valve, tubing, and diffusion method. If you wish to control the flow of CO2 with a timer or a PH monitor, you will also require a solenoid. A regulator is the device that converts CO2 in the cylinder to a lower, safer pressure so the plants in your tank can thrive. What is a needle valve? A needle valve is a device that is responsible for lower the working pressure and controls the rate of flow in your aquarium. What is a diffusion method? A diffusion method is what dissolved the CO2 in your tank’s water. There are numerous types of diffusion methods, but the main two are active and passive. Active diffusers combine the water and CO2 in a sort of current. Passive diffusers simply release CO2 into the water column so it dissolves on its own. What kind of tubing should I use? You will be able to use whatever type of tubing you want, but I highly recommended that your steer clear of silicone tubing because it can lose up to 6% of CO2 per foot. Vinyl tubing is a good option but it can easily break down fast if it becomes exposed to sunlight. The right subbing in your aquarium can make a world of difference. Will the inexpensive plastic check valves work? The cheaper plastic check valves will work but only for a little while. Since these valves tend to leak after a while, you should really consider investing in check valves that are made of some type of metal. A solenoid is an electrical valve that is typically closed, but it opens up when power is applied. Will the change in pH from the CO2 harm my fish? CO2 does change the pH of the water, but your fish will not be harmed in any way. In the wild, changes in pH are typically caused by changes in kH or carbonate hardness, as well as TDS or Total Dissolved Solids in the water. These sudden changes can cause larger fish to experience osmotic shock. A vast majority of fish will be able to handle a more significant pH change because of hardness. Can I use my spare propane tank for CO2? No, you definitely cannot. Propane tanks aren’t designed to hold the same pressures that CO2 cylinders are. Propane tanks are welded, whereas CO2 cylinders are completely seamless. CO2 tanks are specifically designed to hold pressures exceeding 1600 PSI. Propane tanks are built to hold 250 psi at most. The standard operating pressure for a CO2 cylinder at 70 degrees Fahrenheit is 800 psi. How do I know how much CO2 I have in my aquarium? There are a number of different ways to measure the amount of CO2 in your tank. The first method is to use the pH/kH/CO2 chart, which you can find in my Guide. Keep in mind that there are some problems with this method, including that there can be small inaccuracies in your test kits, which can have negative implications for your tank. The other problem is that if any buffers others than bicarbonates and CO2 are being used in the water, your results will not be completely accurate. 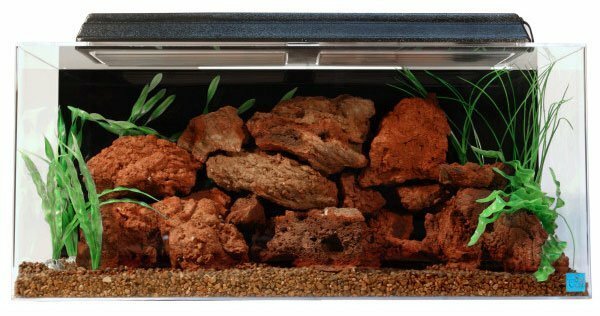 Peat, wood, and even some small rocks as well as pH buffers can throw off your results. Another method that you can use to measure the level of CO2 in your aquarium is to take a water sample from the tank and simply measure the pH. Allow the sample you take to sit for 24-48 hours and measure it again. If you have a drop of even one degree in the pH, then you have 30 ppm of CO2. While it is true that this method works, it can be a bit slow and tedious. There is a new method that is becoming quite popular and it is called a drop checker. I won’t go into too much detail about this method, but you can check out the forums at www.plantedtank.com for more info. Is the electric method (like a Carbo-Plus) effective at making CO2? The short answer to this question is no, not at all. You will find that these units cost just as much if not more than a pressurized system. In the long term it is much more costly to run these units than a pressurized system, and they also tend to strip the kH out of the water to make the CO2, which in turn has a negative effect on the water chemistry. With the electrical method you will have a very hard time maintaining healthy CO2 levels, which is why you will typically see these types of products on sale with a fairly huge discounted price. Will the pH drop/rise from CO2 hurt my fish? No, it will not. The pH should drop once you have added the CO2 to your tank. If you are using a timer to turn off the CO2 at night, the pH will begin to rise. The changes in pH will not negatively affect any of the fish in your tank, so you won’t have to worry about that at all. This is because in the wild when pH levels rise or fall, there is always a change in the hardness and TDS or Total Dissolved Solids of the water. It is the change in the hardness and TDS, not the pH, that can cause Osmotic Shock among fish. Added or removing CO2 will not change the hardness or TDS, so there will be no effect on the fish. This Sea Clear 40 Gallon Acrylic Aquarium stands at 36” wide, 15” long and 16” high, available in two colors; suites reef, marine, salt and fresh water aquatics. Sea Clear Tanks are renowned for quality, selling some of the best aquariums on the market, to back this up a limited life time guarantee is included against leakage and provided with an aquarium lid with a 24” UL fluorescent lighting hood (compatible T8 or T12 fluorescent tubes). 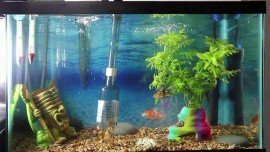 Acrylic aquariums are ideal for warm marine aquatics as the thermal retention is far better than that of Glass similarly, as per our Glass vs Acrylic discussion, users can quite easily drill to fit heating and filtration customizing without the risks of cracking / breaking glass. Most people believe acrylic tends to discolor with the material having progressed it no longer clouds, instead most users report the clarity of the Sea Clear 40 tank to better than glass as it tends not to distort. SeaClear molecular bond and heat polish their edges together to retain strength and prevent any possible fractures, cracks or breaks at the seams. One word of warning with an Acrylic aquarium use a plastic algae scraper, rather than a metal one, to prevent scratching the acrylic and attempt to keep coral away from the acrylic. Blemishes can easily be buffed out although will require some elbow grease. 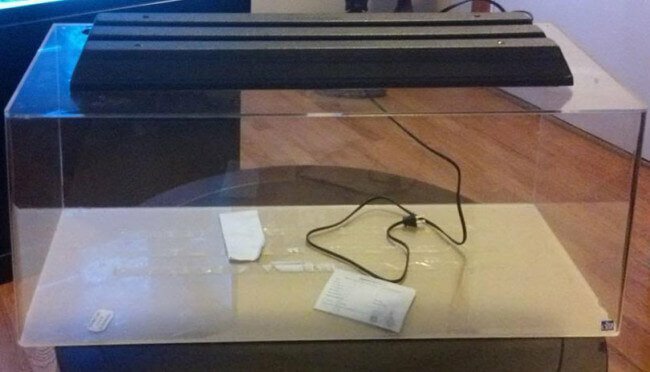 This SeaClear 40 Gallon Aquarium is good value for money when compared to other acrylic aquariums albeit a more expensive than its glass counter-parts. A good quality hood is provided although with the introduction of LED lighting, and the ability to change the color temperature, many experienced aquatic hobbyists have chosen to upgrade it. Backed by a quality brand name and reassured by a life time guarantee, if you are looking for a medium sized aquarium this SeaClear acrylic tank ticks most of the boxes. Check availability at Amazon.